Even though I no longer live there, I admit I am always delighted to see Ottawa's own Herieth Paul (who is doing her hometown very proud) featured either on the runways (She opened for Burberry Prorsum this season!!) or in the pages of a magazine. This talented young lady having some major fashion moments, and so I was delighted to see her star in a Flare editorial featured in this month's most recent issue. 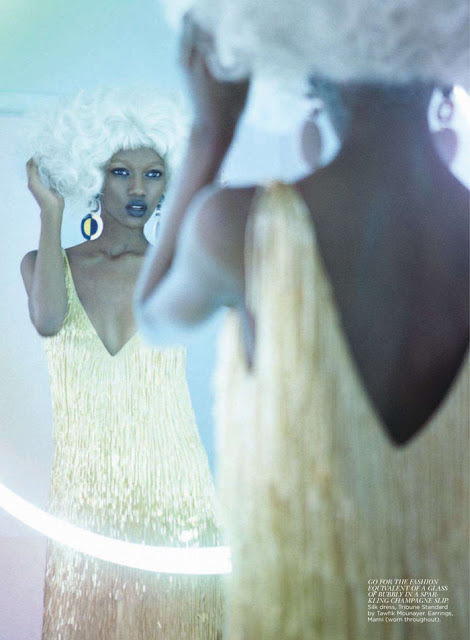 Shot by Max Abadian and expertly styled by Liz Cabral, Herieth shines in some seriously lovely jazzy ensembles and what can only be described as a pretty major blonde wig. My favourite? The last shot at the piano. Beauty. I looove the second one. It's not the most stylish of the photos, but I adore the Josephine baker reference with the headpiece. Wiaw! I love seeing talented Canadian designers making it big! Great shoot. I love the last shot too! REally captures the feel of the jazz age!